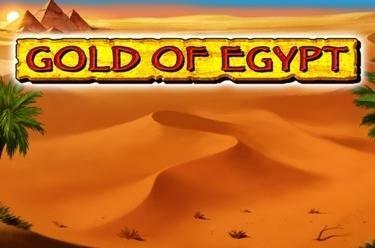 Play Gold of Egypt online for free now! With Gold of Egypt you play on 15 reels that each cover one of 15 playing positions. The Pharaoh is the most valuable symbol in the game. Fill as many playing positions as possible with matching symbols! You already win if at least 2 Golden Masks land in a spin; all other symbols grant winnings from 4 or 5 matching symbols in any position. If each game position shows the same symbol you crack the jackpot! There are no given winning patterns with Gold of Egypt. All symbols act as Scatter symbols that pay out a win in any position if a sufficient number of symbols land. The Golden Mask of Tutankhamun only appears in the middle playing positions. 3 or more Golden Masks trigger 10 free games. If at least 3 Golden Masks land during a spin you earn 10 free games. Initially, a random Bonus symbol is selected for the upcoming 10 free games – the Golden Mask is excluded from this selection. If the Bonus symbol lands during free games it is fixed in its position until the end of all free games. 15 identical symbols earn the jackpot! The jackpot amount depends on the current game stakes and the respective winning symbol. 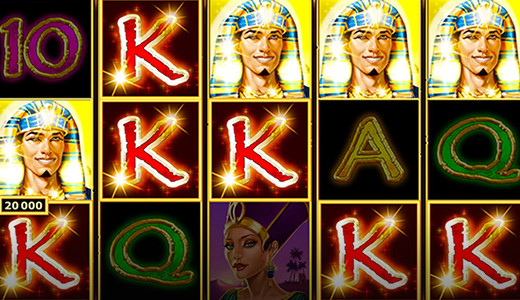 The highest possible jackpot win that you can get with your current stakes and 15 Pharaoh symbols can be viewed in the jackpot display in the top right of the screen. The paytable shows all other jackpot options. Ancient myths and legends tell of Tutankhamun's hidden treasure chamber. It is said to be located in the midst of the ancient Egyptian desert and filled with precious treasures. Many have tried to find it and failed. Go on a quest in Gold of Egypt – with a whiff of good fortune you will discover the treasure chamber and take home plenty of golden Twists!